Red Sand Cycle: We're finally going to Mars! Man, that Weyland ID is neat. Dunno if it’s good, but neat. The ID and the upgrade both work on agendas. 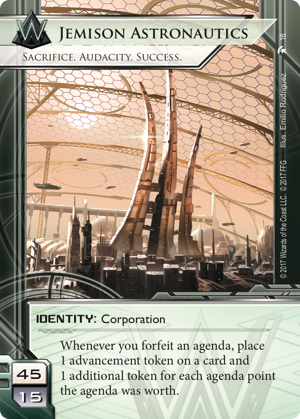 So…you’re going to sacrifice agendas to be able to fast advance agendas in order to be able to sacrifice agendas so that you can fast advance other agendas? 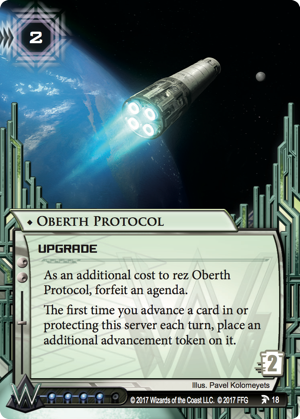 The ID and Oberth can turn an Hostile Takeover into a 5/3. Seems like an alright trade. At least we got the Weyland disappointment done with super early. I like it, MCA informant and Warroid Tracker both look really cool (depending on costs), and Oberth looks fairly legit even just in Titan FA. Interesting how no new mechanics have been announced. Personally I approve, as it’s better than going into gimmicks. Khan players now have to wait for Keros. Also, I’m calling Reina gets killed this cycle. rez Oberath sacing the 5/3 place 4(!) advancements on GT. If I’m not mistaken, I think she has already been captured by Weyland a while ago. Not confirmed death, but I think they did nab her. It was in one of the flavor inserts, I wanna say. I wasn’t sure whether she was killed at the end of spin, maybe you’re right. Damoin apparently likes her, so hopefully we get some references to her this cycle. 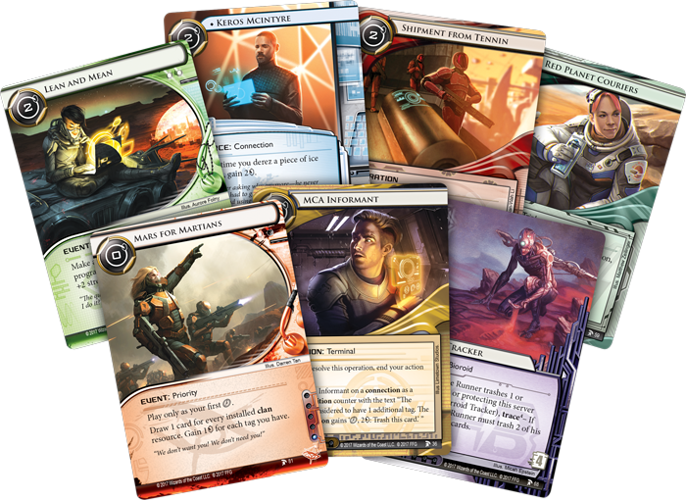 Additionally what do people reckon are the chances of this being a 2 id cycle, maybe Weyland and Anarch to replace what we lose in Spin? Lean and Mean does make it look like we’re getting a shaper though. These spoilers have me a bit wary. Tribal themes and a lot of obtuse mechanics starting to venture a bit too far into the territories of other games that I left for my own reasons. I don’t mean to knock the designers; they’re trying to keep it fresh and that’s admirable. 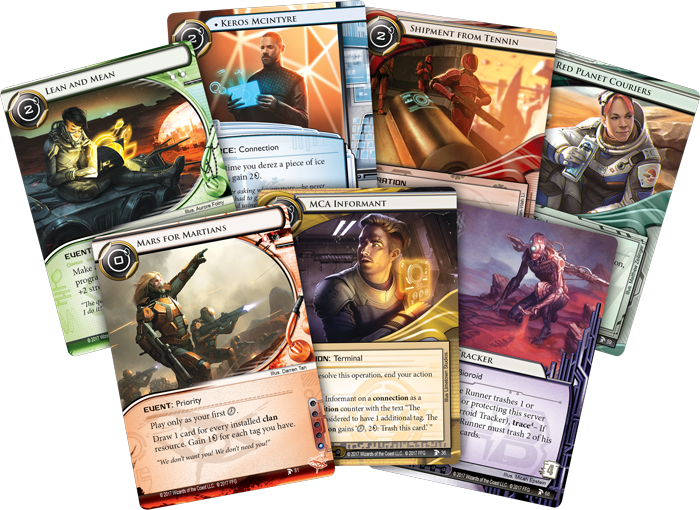 I am sure I’m just being too cynical, but the overall aesthetic of these few spoilers don’t seem ANR to me. They probably just want Mars to be obviously different, and thats probably fine. Honestly I’m sick of spoilers so far in advance. Would have preferred these to be held off until we are at least at pack 5 of 23S. Looks neat! I think the nice thing about such a different setting is that you can explore some slightly different concepts while still keeping it separate from the ‘main’ theme of the game. 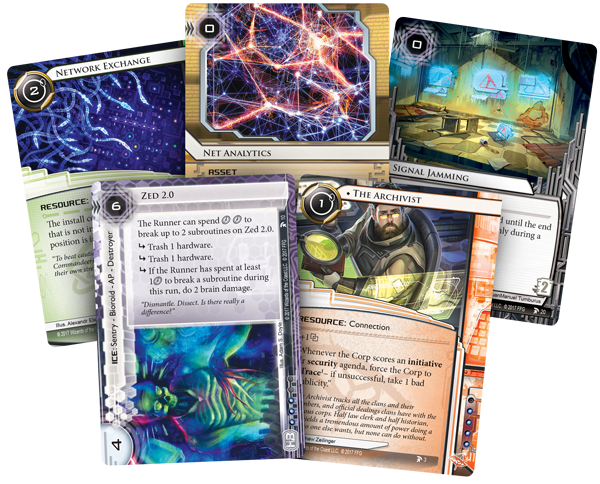 Kind of Netrunner’s Rogue One, if you like. Also any bets on an ice named after Elon Musk? Don’t look at them, then. Pretty much this yeah. I dunno, I kind of like the idea as it reminds me of firing booster rockets to break atmo. I think it is neat. I don’t think we will see Reina “killed off”. Instead I half expect her card to be her in a prison cell somewhere, or her getting sprung. Her story is probably done as a runner, but I totally would peg her for a resource in the future. “The Red Queen” as a connection. Reina’s book is also on the way. It’ll be neat to see if it ties in.